The Omega Man movie remake is actually the 2007 film I Am Legend. I Am Legend the book - Author Richard Matheson publishes his sci-fi novel in 1954. The Last Man on Earth - This 1964 film based on the Matheson's I Am Legend stars Vincent Price and is released in 1964. Omega Man - Another film adaptation of the book starring Charlton Heston as the lead role of Robert Neville. This film hit theaters in 1971. I Am Legend the film - This 2007 film starred Will Smith as the lead role of Robert Neville. It is a remake of The Omega Man but reportedly includes more details from the book than the 1971 Charlton Heston Film. I Am Legend is one of those older Hollywood films that have found successful ways to retell the same story after some new scriptwriting and applying a few modern techniques. If you were comparing all three films strictly based on cinematography, then of course, the 2007 Will Smith version would emerge the winner. As for the storytelling of the film, you may just have to rent all three films and compare. That could be especially enjoyable if you love the book and want to discover how different scriptwriters and directors adapted the book to film. Since I Am Legend is the Omega Man movie remake, let's focus on that. In 1970, Warner Brothers bought the rights to Matheson's book I Am Legend in order to make The Omega Man. The studio hired daytime soap opera writers Joyce and John Corrington to adapt the novel to film. When released, the film garnered mixed reviews. During the 1990s, after experiencing a bit of a lull, the demand for good science fiction films began to increase. As a result, in 1994, Warner Brothers decided to revive the I Am Legend and retool it into a newer, more modern film. Development officially began in 1994, but production hit a few roadblocks on the way from the screenplay to who would play the lead actor. The first issue was with screenwriters. Warner Brothers originally hired screenwriter Mark Protosevich. Director Ridley Scott fired Protosevich and decided to hire on writer John Logan. Scott and Logan spent many months rewriting the script and presented the final version to Warner Brothers, who didn't like it. So, Warner Brothers decided to bring on writer Neal Jiminez and bring back Mark Protosevich. With all the rewrites and staffing changes, by 1998, the studio shelved the entire project. The $150 million budget film went on to gross nearly $600 million worldwide. As with any remake of a film, there are some notable differences in the Omega Man movie remake. In I Am Legend, everyone except for a small percentage of the human population contract the Krippin virus in 2009. The virus was created accidentally, by Dr. Alice Krippin. In Omega Man, the virus is referred to as a plaque that results between biological warfare between China and the Soviet Union. Also, those that contract the virus in Omega Man are referred to as "The Family," while those that contract the virus in I Am Legend are called "Darkseekers." Will Smith's version of Neville dies in a self-inflicted explosion. By doing so, he saves the lives of Anna and Ethan while killing the "Darkseekers," who are close to breaking into his lab. Anna and Ethan have a cure for the Krippin virus, given to them by Neville just before his death. In Omega Man, Charlton Heston's version of Neville ends up dying at the end of the film while a group of people drive off to join other survivors of the plague and restart the human race. 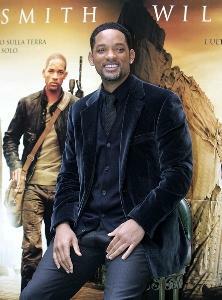 Though many critics didn't love I Am Legend, many sci-fi film buffs and Will Smith fans did. Reportedly, the studio is in talks for a sequel to the box office blockbuster film. Given that Will Smith's character died at the end of the film, many aren't sure how successful a sequel would be. Of course, Hollywood also loves making prequels, so that's a distant possibility.